If you’re considering switching careers to real estate, you might be wondering, “how much does the average real estate agent make?” Planning ahead to know how much you can expect before starting a new career will help you understand how much to save and how to adjust your budget during the career transition period. We surveyed real estate agents across the country to learn what their annual earnings are, and what factors impact how much money they make. A real estate agent’s income is highly dependent on many different elements such as niche, years of experience, how many hours they work a week, and even their happiness. The answer to “how much does the average real estate agent make?” isn’t as simple as giving one dollar figure. To get an accurate number, you need to take into account where they fall on the spectrum for a variety of different metrics. How much does the average real estate agent make? 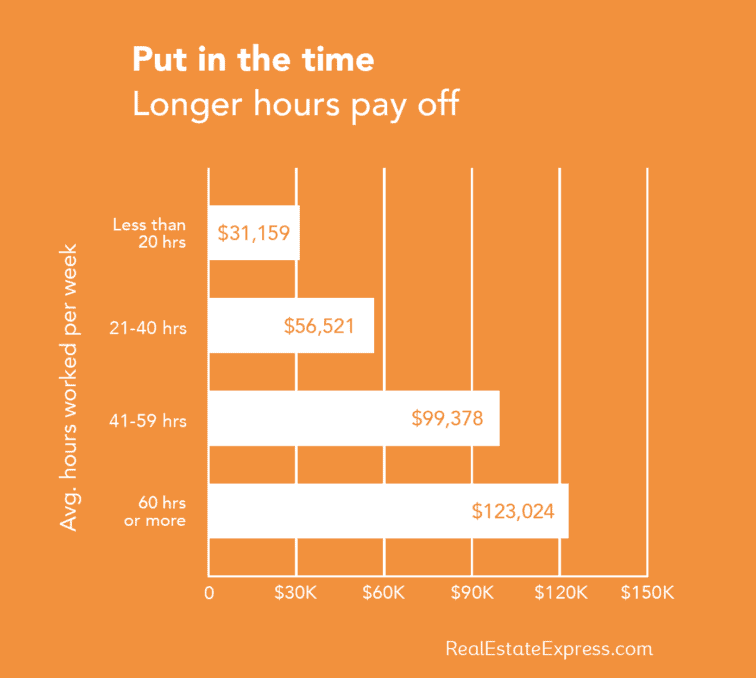 One way to figure that out is to look at what agents who put in an average amount of hours are earning. In real estate, longer hours usually mean higher earnings. Agents putting in 40 hours a week can expect to make around 56,000, according to our survey. Agents who work between 41 to 59 hours a week report earning an average of $99,378. 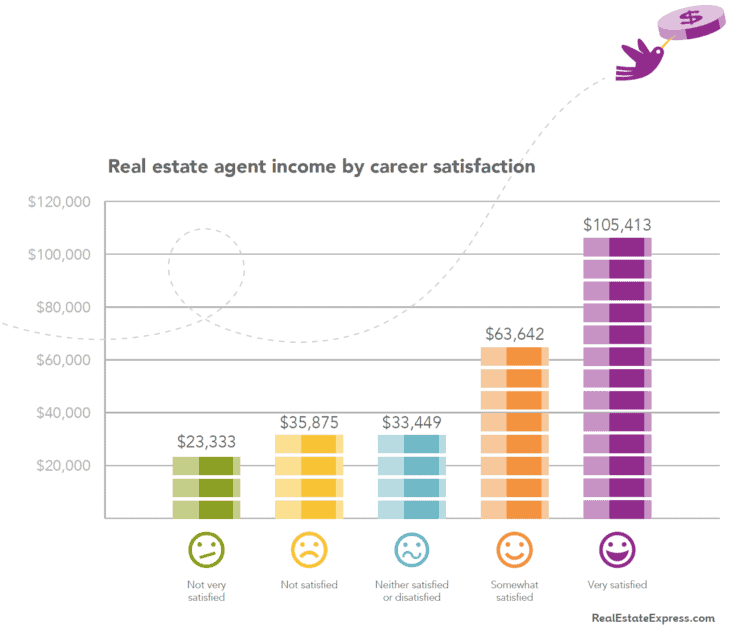 You might not think that job satisfaction has a big impact on how much a real estate agent makes, but research shows that happy agents make up to 4.5 times more than those who are unsatisfied in their career. 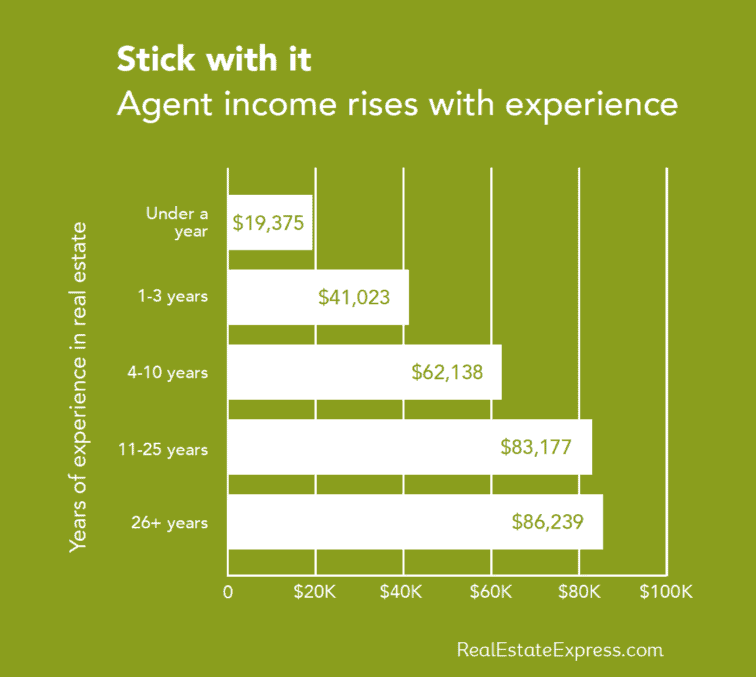 In real estate, having more experience typically means a real estate agent will earn more. A real estate agent in the middle of their career might earn somewhere between $60,000 to $80,000 dollars. Again, this number is dependent on other factors which influence the average real estate agent’s earnings. What an average real estate agent makes varies by niche. 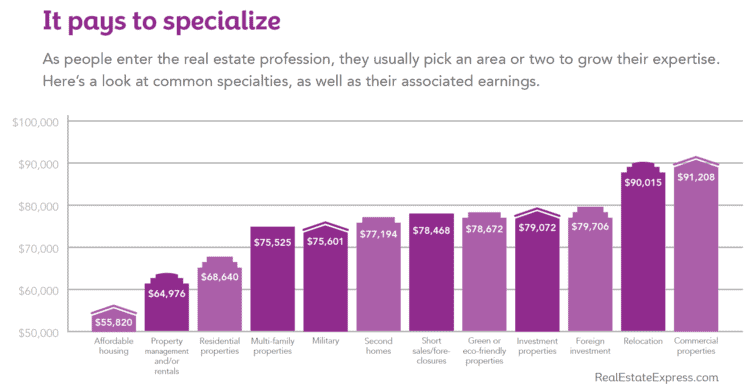 The average residential real estate agent might earn less than a commercial real estate agent. In general, average real estate incomes tend to fall in the $70,000 range, while some niches, like property management or affordable housing, have notable lower incomes and others, like commercial or relocation, have markedly higher earnings. Another variable that can influence the average real estate agent’s salary is brokerage type. For example, an average real estate agent working at a regional franchise can expect to pull in $34,167 annually. 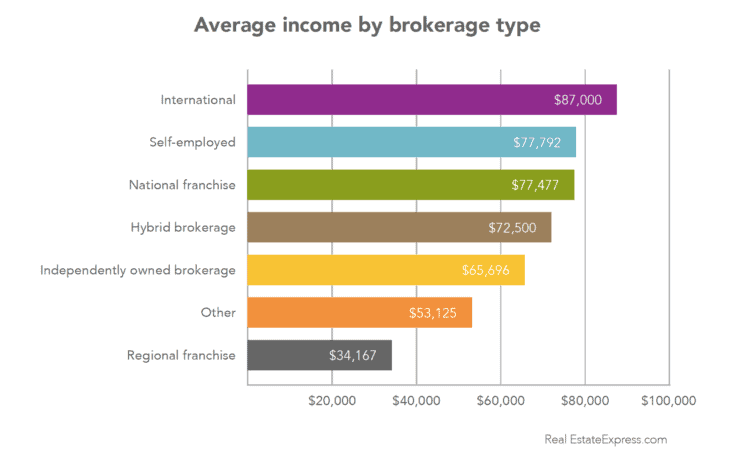 That’s the average income of agents we surveyed who work at regional franchises. On the other end of the spectrum, working at an international brokerage could mean an average income of about $87,000 annually. That’s a big difference! Both are “average” earnings for each niche. So when you ask, “how much does the average real estate agent make?” the answer can be wildly different depending on the brokerage. How can a real estate agent rise above the average income? Your earnings don’t have to be defined by what’s “average” for your niche, experience level or the amount of time you put in to your job. There are always ways to beat the odds and rise above the median level of earnings. We’ve found that agents who are earning more typically excel at managing their marketing dollars, finding quality leads, winning real estate listings and staying updated on best practices. To help you earn more, we’ve put together a blog post that gets into each of those topics so you can maximize your potential.